Diamond Head makes nice low cost Ukuleles and the DU-150 is just that. 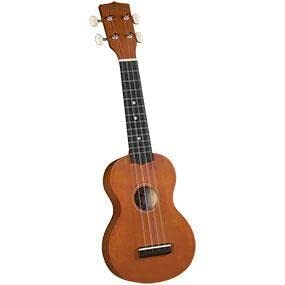 It is quite the popular ukulele and does a good job at a low price. The customer reviews have been positive. Please note, that we are suggesting this as a good choice of instrument, but not selling it directly. You can use the link here to purchase it though. The Diamond Head DU-150 Soprano ukulele is a fine-toned, affordable instrument with a true vintage look and sound. The lovely dark Mahogany stain in a semi-gloss finish gives the look of a prized, vintage collectible. The neck and body are made of resonant maple and the fingerboard and bridge are dark-stained hardwood. The low, smooth nickel-silver frets ensure a low, easy playing action and the quality nylon strings give the true, mellow sounds of the Hawaiian Islands. The nut and saddle are white ABS and the fingerboard has pearloid position dots. The guitar-style, nickel-plated tuning machines have white buttons and their high gear ratio and smooth action make tuning easy for the beginning student. The DU-150 comes complete with a sturdy gig bag of black nylon featuring the Diamond Head logo. Making its first major appearance in the USA at the 1915 Panama-Pacific International Fair in San Francisco, the ukulele continues to delight and attract fans of every age, gender and skill level. Little has changed in the design over the years proving that it’s never a good idea to change something that works! The Diamond Head Traditional maple ukulele, finished in a warm brown mahogany hue, really looks like an expensive ukuleles, but is really more affordable than you think. You get a classic look, the right sound, all for an affordable price without sacrificing tonal quality or playability. The maple we use imparts a crisp, bright edge to the otherwise warm, airy island sound that is most familiar to all. Normally, affordable ukuleles are often perceived to be more “toy-like,” than taken seriously as a genuine musical instrument. With a Diamond Head Traditional ukuleles, you can be sure that each one is constructed with the same attention to detail that might only be expected in more costly instruments. From all angles, the construction is clean, and the fit and finish will exceed expectation. We wanted the DU-150 to have that classic look that might appeal to the individual wanted a more traditional look with features found on more expensive instruments, but without the high price tag. The painted fingerboards have accurately spaced, smooth and polished frets, while the guitar-style, geared tuners are more accurate than planetary-style tuners; effectively taking the guesswork out of tuning. 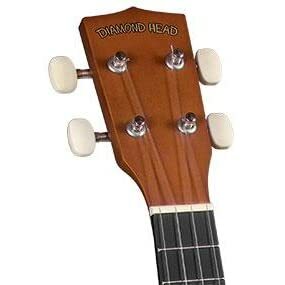 Diamond Head Traditional Soprano Ukuleles – Traditional sound and classic look make this Diamond Head a Luau Favorite! 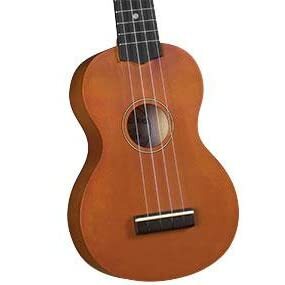 It’s never been easier to afford a quality soprano ukulele that has the classic island look and sound. The DU-150 put all the right features together in one fantastic and affordable instrument. With its soprano-sized body, guitar style tuners, and rich mahogany brown finish, the DU-150 will astound everyone with its great sound and affordability. Just try one for yourself. ..Hawaii Calls!